Following the end of the Memorial Cup last month, Windsor Spitfires coach Bob Boughner talked about how he knew he was going to lose a few key players. What he didn't say was that he would be replacing them with a few pretty good ones. Two of the players that will be part of next season's quest for a first-ever Memorial Cup three-peat are goaltender Jack Campbell and German forward Tom Kuehnhackl. Campbell is best remembered for backstopping the U.S. to victory in the gold-medal game at January's World Junior Championship in Saskatoon, and then winning a second straight gold medal for the U.S. at the World Under-18 Championship. He's the No. 2-ranked goaltender on NHL Central Scouting's list of North American goalies available for the 2010 Entry Draft. Boughner will have to be creative to find the right amount of playing time for Campbell and Philipp Grubauer, Windsor's goalie this past season, but that kind of goaltending depth is a nice problem to have. "Jack's a pretty special goalie," Boughner told NHL.com. "It's a tough situation. Not one of these guys wants to take a backseat. It's a problem we have on our plate (but) Jack Campbell is a huge, huge addition for us and a guy we've coveted for a long time." The Spitfires originally selected Campbell in the sixth round of the 2008 OHL draft, but he elected to join the U.S. National Team Development Program prior to playing at the University of Michigan. However, after two years and a raft of gold medals and trophies, Campbell decided earlier this season to forgo college for the Canadian junior route. "I was 100 percent going to college," Campbell said, "however, the National Team Development Program really accelerated my development, putting my goals quicker to where I could reach them, and that's playing in the National Hockey League. I'm a hockey guy. I do well in school, but hockey is my passion. Going to Windsor will provide me with a ton of games next season, an NHL-type playoff schedule and a great coaching staff with (owner and GM Warren) Rychel and coach Boughner there. I think that's the perfect opportunity for myself." "I think when they come here, we've bred that winning culture. You have to set your goals high, and we will for them. But we never ask anybody to be Superman. We won by committee before. Jack (Campbell) is going to be a big part of that just like Tommy Kuehnhackl. But never will they have that pressure from us to carry the team. If we're going to try to win next year, everybody's going to have to do their job." It also helped that a couple of Campbell's friends, Kenny Ryan and Cam Fowler, were able to sell him on the positives of joining the Spitfires. "Cam and Kenny Ryan are two of my best friends on my Under-18 team from last year and they've been great," Campbell said. "They haven't recruited me to go there but they gave me insight on what it's all about and really made me feel comfortable about going there and really excited." "We are excited to add Jack to our team next season," Rychel said. 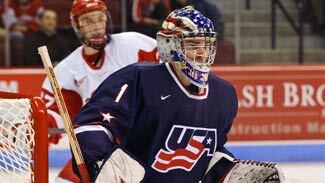 "He is one of the best goalies in the world in his age and one of the top rated goalies for the 2010 NHL Entry Draft. Jack is a world-class, high-level talent as well as a quality kid who will flourish in the Windsor Spitfires program." There's a similar feeling toward Kuehnhackl. A 6-foot-2, 172-pound right wing, he's No. 8 on Central Scouting's final ranking of European skaters for this year's draft. He played last season with Landshut in Germany's second division, where he had 12 goals and 21 points in 38 games. Windsor traded up to draft him at No. 24 in last summer's Canadian Hockey League import draft. "We wish he would have come here last year, that's why we drafted him," Boughner said. "We knew there was a risk of not having him. Warren has gone overseas to watch him play. … He's a big guy, great skater, real raw and we think we can bring out the best him." Kuehnhackl feels the same way, which is why he can't wait to get the season started. "I want to improve myself in every kind of stuff you need in hockey," he told NHL.com. "Upper body (strength), lower body, skating. Best way to do it is to play in Canada. In Germany you can improve yourself, but not as good as Canada." He felt he didn't get that chance this season, and in hindsight believes it was a mistake to stay home for the extra season. Kuehnhackl believed he would get more of a chance to play in the top division, but he played just four games with the Augsburg Panthers. "I decided to stay in Germany, play there, but that was a mistake because I didn't get a lot of ice time and I was just on the bench," Kuehnhackl said. "That's why I'm going to Canada." The Spitfires are ready to have him. Facing the possibility of losing nine of his top 10 scorers from last season, Boughner will expect a lot from Kuehnhackl. "He's an elite-level guy," Boughner said. "It's going to take an adjustment period, but I think after Christmas and moving forward, you're going to see him have an impact for us. … He's going to have a learning curve and once he figures it out and learns what we're expecting, he'll be a top-six forward." The goal in Windsor is pretty clear – a third straight OHL and Memorial Cup titles. And the reinforcements are going to have to climb on board fast. However, Boughner said he won't be putting any extra pressure on his newcomers. "I think when they come here, we've bred that winning culture," he said. "You have to set your goals high, and we will for them. But we never ask anybody to be Superman. We won by committee before. Jack is going to be a big part of that just like Tommy Kuehnhackl. But never will they have that pressure from us to carry the team. If we're going to try to win next year, everybody's going to have to do their job."